In this picture, Lach had just spit up all over David’s face. It was in his eyelashes and pooled in his ear. At the moment, David didn’t think it was quite as hilarious as the rest of us did, but oh, what he would give to be puked on by that boy again! Finding gratitude as the griever is helpful, but it’s the gratitude of the rest of the world that I want to talk more about today. As a mother who has just buried a child, it is unbearable to hear someone complain about just about anything. Complaints from others about mundane ordinary discomforts will knock the wind out of a newly bereaved mom. When your child was just torn from your life, it seems heartless of others complain about having to clean up after their kids, the thing a spouse did to irritate them, the weather, a bad hair day, or a nasty cold that will be gone in a few days. It is especially maddening for a mother, who is missing her child with her whole being, to hear others complain about the frustrations of caring for children. When you would give anything to clean up the floor for the 100th time today, to have your child vomit on your lap, to argue incessantly about which coat is appropriate for the day, or to get another drink of water for the child that won’t go to bed, it becomes clear how thankful we should be for even grating moments like that. Don’t get me wrong, I am guilty of voicing those silly complaints both before Lach died, and even now, when I know better. When I’ve teasingly thrown out the comment that I’m ready to sell a child, I recoil at my own words…I would still give anything to have a moment like this with Lachlan. With a topic today of gratitude, my challenge for all of us is to approach the day with a heart that remembers how fragile and temporary life is. Consider a newly bereaved mother or the mother who knows that her child’s days are numbered as you look for things to be thankful for. We all need reminders to step back and see the big picture, otherwise it’s too easy to take for granted the things we should be most grateful for. We all need to recognize the duty to be thankful for the simple and standard but most important things in our lives. In the wake of a death it becomes crystal clear that the single most important thing to appreciate is the presence of the people in our lives, imperfections and all. We also need to take the time to genuinely appreciate a healthy body, a warm house, a secure job, reliable transportation, and an abundance of food. These things are not guaranteed to us, and in one sudden tragedy those things that are so easily overlooked can be gone. Lastly, we have to challenge ourselves to look for the opportunities to be thankful in the little irritations of the day. Let me be thankful for the opportunity to take my child to the doctor for a well-child visit--even if that means a long wait in the waiting room, for the opportunity to sit in the freezing rain to watch my child play a flag football game, to read the same story for the millionth time, to sweep the floor again. Let me remember to be thankful for the cozy bed and the child to send back to it for the 6th time that night, for the piles of homework, for the Lego I stepped on, for the laundry that is never done, for the little voice that says “Mommy!” and interrupts the task at hand. 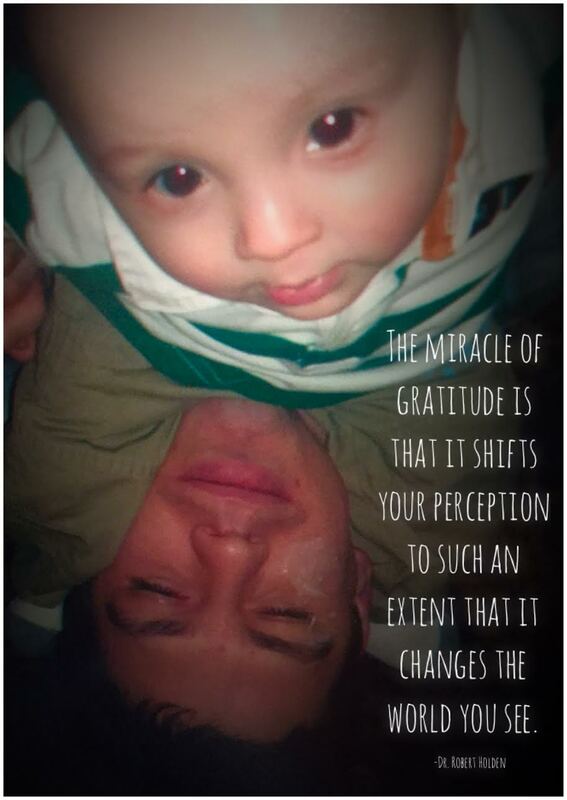 Gratitude changes the world that we see. It dissolves the irritations and fills that space with joy. Who doesn’t want that?